Speaking of all things Tactical (Brad and I tease each other a little bit about that whole “Tactical” thing), I am so excited to be doing this story about Brad Martin and his Tactical Keychains business. It’s one of those storybook successes that so many entrepreneurs dream about. He is his own man with his own business, completely independent, and much loved by his customers. The fact is, I even had to succumb to his super cool TUKK (Titanium Utility Knife Keychain), and traded our G-Wizard software to him for a TUKK. It’s just one of many uber-cool products he has created over the years. Brad’s been a fixture in many of the CNC places I hang out, and we have often exchanged comments and emails. 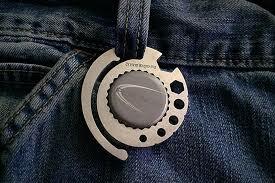 Tactical Keychains TUKK: Super handy, made of Titanium, and uses a replaceable X-acto blade. Had to have one! Brad, I’m so glad to have you for our Customer Spotlight series! I’d like to start out by asking you to tell us a little about your business? 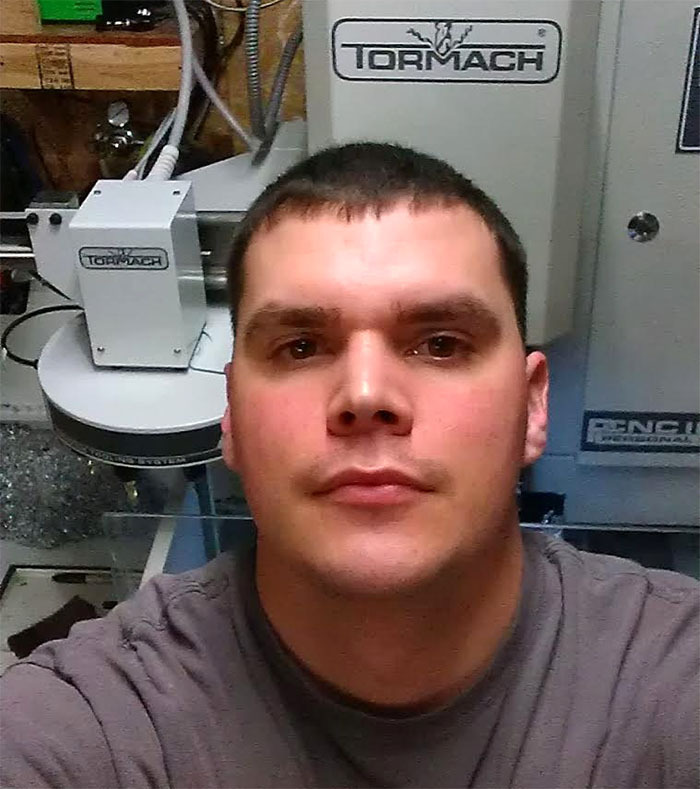 Here’s Brad, CEO, Entrepreneur, the Brains, the Brawn, the Boss at Tactical Keychains. That’s how it is for Entrepreneurs. I work out of my garage as a one man operation. I make everyday carry (EDC) items and I do everything from Design, to Shipping. 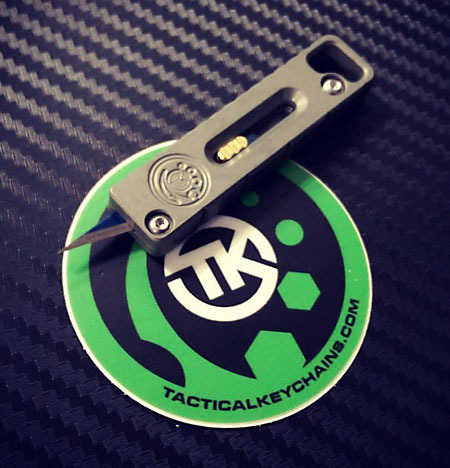 How did you come up with the idea for TacticalKeychains? It was an accident. 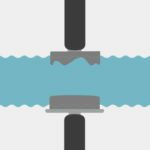 I was about to lose my job working on Wind Turbines due to a possible loss of a government subsidy. So I decided to design a bottle opener called the Bottle Grenade (has been featured on cnc cookbook) and it was so popular I was able to purchase a Tormach 1100 and start doing this for a living. It was a big risk. How did you launch the business? How did you make people initially aware of it? 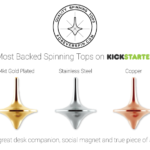 Kickstarter.com on December 2012 is when I launched my first project. I did no advertising, I had no online presence or social networking. I took the huge success of the project as a light bulb moment: “I can do this”. It still took me quite awhile before I got into social media, and today I’m really only on Instagram and YouTube with a total of over 20k followers. I have had 11 overly successful Kickstarter projects and couldn’t of done it without all the awesome support from strangers who I now consider my friends. 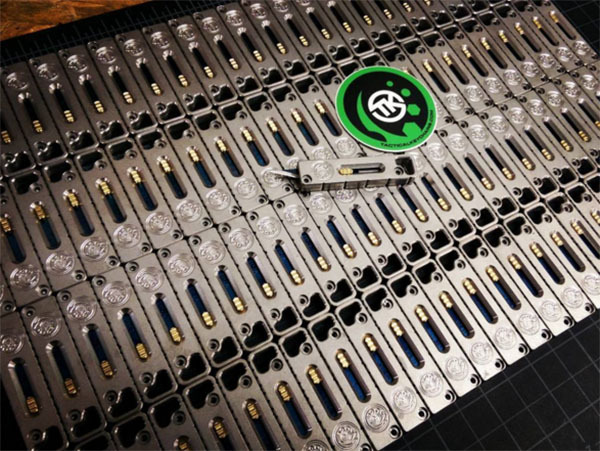 My first project did 42,000$, my next project did 85,000$ – As a person who had never had a social presence I was now in the spot light with one of the largest EDC projects on Kickstarter at that time. Companies were coming out of the woodwork wanting me to go retail, and many other crazy things. It was the most stressful time of my life, but had I backed down I wouldn’t be where I am today. The biggest challenge was that I asked for $2500 for the projects so I could buy a small lathe, I set my ship dates for that $2500 in product. So when it made 42k and 85k that just made me push harder to get my products to my customers on time. I am very happy about my record of delivering on time. Many many many Kickstarters deliver late. Better than I could of ever dreamed. I still pinch myself to see if I’m dreaming. I have the best customers on earth! Variety is the spice of TUKKs? 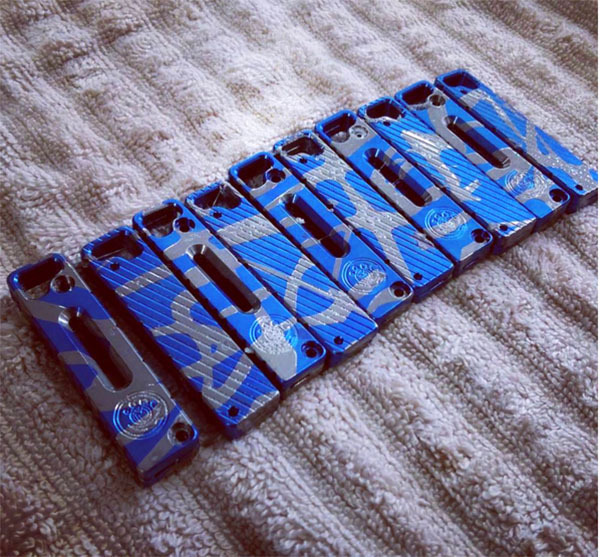 Gotta love that anodizing! 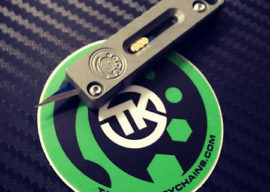 What are your plans for Tactical Keychains going forward? I don’t plan to grow, that may sound odd to most people in business. My business is 100% debt free and every year I have bought 1 or more machines. I like being able to walk out into my garage and work. Don’t have to warm the truck up or anything like that. Being a debt free business I’m free to go fishing any time I want and not have to worry about bill. Many other “makers” take the opposite route and are in large debt, I personally couldn’t handle that, my hair is turning grey quick enough! I work out of a standard 2 car garage 20×24 and have a Robodrill, Tormach 1100, and 2 GT-27 lathes, along with a Grizzly gunsmith lathe and.. well the list goes on. Best thing to do is watch some of my videos on YouTube to see what a person can really do with 480sq ft. I take pride in my organization and people still can’t believe it’s all in here and doesn’t feel crowded. I recently traded in my 2 cnc lathes for 1 cnc lathe with live tooling. I realized that I never run both lathes at the same time, and got a great deal on trade in with Dynamic CNC. I would have a different logo. I used a logo company and was in a rush and really had no idea what I wanted to be for a company. I came up with Tactical Keychains after doing my WTF project, as that and the Bottle Grenade were sort of on the “tactical” side of things I guess. I knew I wanted to make keychains, however I ended up making an edc pen aswell. So.. My name doesn’t really fit exactly what I make anymore. I’m happy with the Tactical Keychains name I guess :). I really haven’t made any mistakes other than wasting money on a cnc plasma and cnc laser that never got used and I finally sold. I probably lost 5,000$ on the deal, but early on I wasn’t 100% sure what I wanted to do. Early 2012 I bought a Taig CNC Mill, I typed in questions relating to CNC and learning and your website was up at the top of google every time. I have probably read every article. 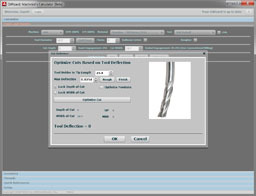 G-Wizard is the perfect software for beginners as in the end you WILL save money, because endmills aren’t cheap! Anything else you want our readers to know about your business or your story? Thanks Brad, for the interview and for all the cool products you make! Folks, Brad is real easy to talk to. I’m sure if you have a question for it and post in the comments he’ll respond. 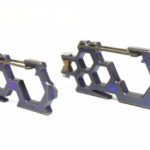 Meanwhile, Tactical Keychains is a great example of what CNC’ers can do to become independent with their own businesses. 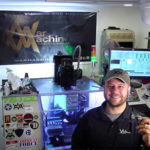 We live in an amazing age where the Internet makes it possible for the world to find you, Prosumer-Grade machines like Brad’s Tormach make it possible to get started manufacturing cheaply, and your own talent is the key to your success. If you use our G-Wizard software and have your own CNC-related business, we’d love to write a Customer Spotlight article about you. Contact me via email (bob@cnccookbook.com) for details. Thank you very much for the Article Bob!!! Hope you enjoy your TUKK! I’m glad to see Brad featured here! Kudos, man! Kudos! 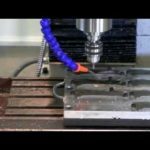 Was curious if you knew much about machining and CNC before you took the plunge? If not, how did you learn? You are an inspiration. Thank you very much! I knew NOTHING, I fixed Wind Turbines for 7 years, wanted to play with CNC so bought a TAIG cnc mill, and basically just crashed it alot until I got it figured out. I learned from Bob here, Youtube, and forums. I “gave back” by starting a YouTube channel and helped people learn CNC, I’m not a teacher, but show examples. Thank you very much!!! Thanks a lot, Brad. Any specific YouTube and forums you recommend for learning, besides Bob’s and your own? Thanks again! Best thing to do is just google/YouTube the exact info you’re looking for. There are just too many channels to weed through, I wouldn’t focus on just one channel.